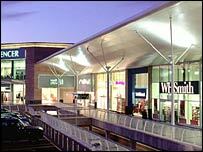 Just one shop is left to reopen its doors at a shopping centre closed because of car park safety fears. Shops at the £200m Castlepoint centre at Bournemouth, Dorset, were closed on 1 December due to fears the 3,000-space car park's concrete was unsafe. The centre was only able to partially reopen before Christmas. Shops have been opening over the last few weeks, with seven more open on Thursday. The last store, TK Maxx, will open on 13 February. A statement from the centre managers read on Thursday: "Castlepoint is pleased to announce that following continuing stringent health and safety inspections the last phase of the re-opening of the car park is now complete."